Police have charged a man with murder following the death of a 23-year-old man, four days after he was attacked. 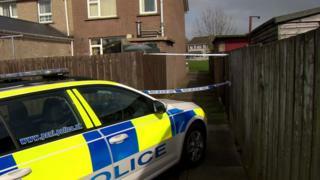 Darren McGurk was assaulted at Glenbeg Walk in Limavady, County Londonderry, at about 18:00 GMT on Wednesday. He suffered a serious head injury and was taken to hospital on Thursday but he died on Sunday morning. A 32-year-old man, initially charged with grievous bodily harm, has since been charged with Mr McGurk's murder. The man, who was arrested on Friday, is also charged with attempting to pervert the course of justice. Mr McGurk's family is "struggling to come to terms" with his death, said Det Ch Insp Peter McKenna of the Police Service of Northern Ireland (PSNI). "I want to establish an accurate picture of what occurred on Wednesday night so Darren's family know exactly what happened to their loved one," he added. "I am also keen to speak to anyone who knows Darren and may have been trying to get in contact with him between 18:00 on Wednesday through to 16:20 on Thursday. "This includes any attempts to contact Darren by mobile phone or on social media."